LEGOLAND® Florida Resort offers great areas to explore including ‘City’ – featuring a driving school where children earn their first ‘driver’s license’ and families compete on Fun Town Fire Academy – a competitive ride that challenges families to get a fire truck from one side to another to put out a faux fire; Imagination Zone - where children can build on their imaginations and race cars against each other; DUPLO Play Area - ideal for toddlers and their growing minds. Here you can attend the Factory Tour at LEGOLAND® Florida Resort - a firsthand look at how LEGO bricks are made from factory to finish; Castle Hill - a medieval area featuring an indoor/outdoor roller coaster taking guests on a ride in and out of a castle where a dragon defends his treasure and Dino Island - where guests can take a trip to prehistoric times and experience their first "thrill" ride. 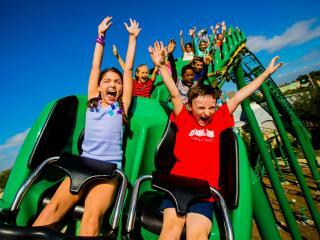 The Dragon – An indoor/outdoor steel roller coaster that features a spirited and humorous view of life behind the scenes within the enchanted LEGOLAND® Florida Resort Castle. The Royal Joust – Kids ride LEGO themed horses through a number of medieval scenes where they encounter other riders in a simulated joust. Las Vegas features the world-famous Strip including the Luxor Las Vegas, New York, New York Hotel and Casino, Excalibur, Mirage, Treasure Island, Tropicana, MGM Grand, Venetian, Stratosphere tower and two iconic structures of Paris Las Vegas: the balloon sign and Eiffel Tower. “The Strip” at LEGOLAND® Florida Resort offers a miniature wedding chapel, monorails and real life sounds recorded in Las Vegas. The architectural landmark is built out of more than two million bricks and represents more than sixteen-thousand hours of creative artistry. New York City features the Freedom Tower years before its completion in the Big Apple. Tiny jets of water shoot up from the fountain in Rockefeller Plaza, while an army of animated yellow taxicabs prowls the streets of Times Square. The Statue of Liberty, a cutaway view of Grand Central Station, The Empire State Building, The Guggenheim Museum and the Bronx Zoo are just a few of the recognizable landmarks available to see with your LEGOLAND® Florida Resorttickets. 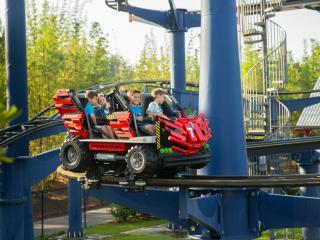 Coastersaurus – This junior coaster reaches curves and dips in and around a prehistoric jungle of animated and life-sized LEGO brick dinosaur. Pharaoh’s Revenge – This outdoor attraction lets children and parents fire soft foam balls at enemies and explore the complex maze of the Pharaoh’s kingdom. 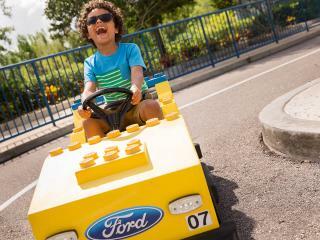 Driving School – A “real-life” driving experience for children ages 6 through 13, where kids receive their official LEGOLAND® Florida Resort driver license. 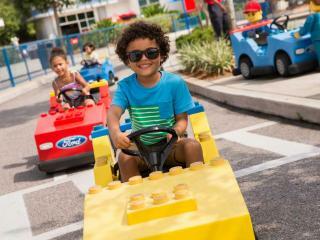 Junior Driving School – A scaled down version driving school course for children ages 3 through 5 Visit DUPLO® Village with your LEGOLAND® Florida Resort tickets. Ideal for toddlers and their growing minds. 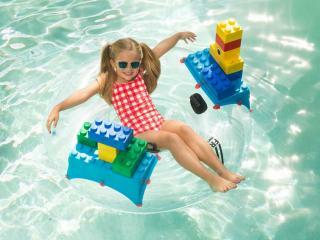 Youngsters can fly a plane, drive a car or explore a whole town – all designed with their height in mind. 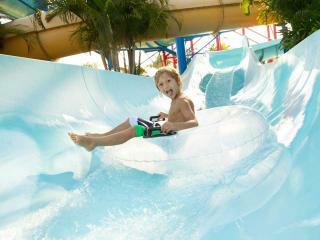 Located right next to LEGOLAND® Florida, LEGOLAND® Florida Water Park features a host of LEGO-themed slides, attractions and play areas including a build-A-Raft lazy river, LEGO Wave Pool, Twin Chaser tube rides, body slides, Joker Soaker interactive playground and a DUPLO® Splash Safari area designed exclusively for toddlers.